In today’s ever-changing social climate, what is it legal to buy and where? I grabbed this definition from Google’s dictionary. So, it seems to me that in order to be considered paraphernalia it has to be integral, necessary or at least useful in regard to the activity undertaken. So, that brings us back to the original question, “can you buy marijuana paraphernalia online?” and the answer is complicated. I think to fully answer the question we need to first understand exactly what makes a particular tool paraphernalia. This is what has always made this whole issue so murky for me. It seems to me that a lighter could be considered paraphernalia. There are plenty of illicit drugs out there that require combustion of one form or another in their particular delivery system. are common enough for legal activity that it’s not even worth lighters being considered as evidence of criminal intent. 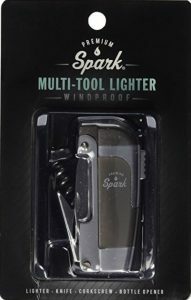 Pocket lighters are used for a myriad of other purposes such as camping, candles, getting rid of nose hair, etc. When I decided to start selling lighters, I never considered whether they might be paraphernalia simply because you can buy them anywhere. They don’t sell anything bad at Wal-Mart do they? Ya, okay. When I was a kid I wasn’t really around any pipe smokers or weed smokers. The only thing I knew about pipes was how sweet and aromatic they were when they were lit. The smell seemed to fill the entire room. I remember smoking cigarette tobacco out of corncob pipes with my friends when we were teenagers. An empty aluminum soda can, crushed in slightly with a small puncture can be a very serviceable pipe. Same goes for a piece of fruit that’s carved out or a drilled carrot would last forever. Anyhow, once a person smokes illegal drugs out of them, they are paraphernalia. And the papers. When was the last time you saw someone roll their own tobacco cigarette? You probably never have, maybe never will. But if you have friends who live in a state where cannabis is legal, then it’s possible they use those papers bought at CVS to administer their medicine. But if a person in a THC illegal state commits the same action then the papers are paraphernalia. It’s all about the laws where you live, your intent and of course, the authorities’ willingness to enforce laws that they may or may not personally agree with. Vaporizers make things really confusing. It is possible to carry a device which is capable of vaporizing nicotine ejuice and cannabis oil. It’s as simple as unthreading a cartridge and screwing another one on. Hell, there’s nothing keeping a person from mixing cannabis oil into their nicotine juice. That makes me think about the last trip I took to my local head shop. Keep in mind I live in a state where THC is illegal. There is no medical or recreational marijuana. But I walk into my local head shop and it looked like some pictures I see on the internet of products being sold in states where cannabis is legal. They had hash wax made from hemp. They had CBD oil made from hemp that was marketed as a nicotine ejuice additive. I don’t think a vaporizer could be considered paraphernalia these days any more than a lighter could. And to further complicate matters, how are they going to determine if you have used it for illegal purposes? Well, if there’s residue in the vaporizer and THC in your system…but how do they measure the THC in your system? A simple Google search will clear that up, huh? No, not so much. There is no reliable test to determine how “high” a person is from THC. Once again, I’ve seen weed hidden in places where you remove weed from the situation and there’s absolutely no way there’s paraphernalia. Anything with a secret compartment could be paraphernalia if it is concealing marijuana in an illegal state. Obviously, my perspective is from the United States. That’s what makes it worse, other countries have different regulations than the US and the United States can’t even agree amongst ourselves or our federal government. There are still states where retailers and distributors are made to jump through hoops to get products on the shelf by arcane laws restricting alcohol percentages and the condition they are allowed to be sold in. Let’s hope we find a little better uniformity on cannabis than we did on the liquor laws. It’s an odd position to find yourself. I live in a state where cannabis is illegal. The federal government says cannabis is illegal. I’m all for state’s rights but what if my state is afraid to ignore federal law? I believe strongly that we need to start listening to each other. Not only that but we need to start speaking plainly to each other and actually caring for each other. Seem More Complicated Than It Needs to Be? None of it makes any logical sense. I sell vintage collectible lighters and I have a Twitter account for that purpose. At least four times in the last month, I have received a direct message from someone offering to sell me marijuana or marijuana and pills. They don’t know anything about me and they are not even worried about that. Sometimes I think we get comfortable and then when we face resistance we tend to accept things we should not accept because we don’t want to lose all the things that make us comfortable. The whole while, growing more and more uncomfortable. Regardless, I don’t think there’s any way any of the products that you’re able purchase legally on Amazon can be considered paraphernalia. In the last year, I have purchased no less than five new butane torch lighters. This article will review the pros and cons of these five lighters along with the price I paid and the place I bought each lighter. The links provided will take you to that product’s page on Amazon.com. By you clicking these links and purchasing, we will earn a commission. Your price will be the same whether you click our link or navigate to Amazon some other way. 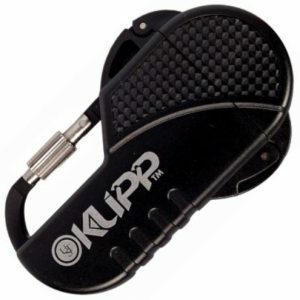 The UST Klipp Lighter with Biner is an excellent choice for outdoorsmen of all kinds. The included biner allows attachment to a belt loop, MOLLE or just about anywhere else. The lighter itself is really reliable even if it is a little difficult to adjust up or down. The only thing that keeps this lighter from getting a perfect score is its plastic construction and the effort that is required to adjust the flame. I quit trying to adjust it because I was afraid I was going to break it while adjusting it. And while the biner clip is nice, it’s not all that sturdy. If you have this thing hanging off you somewhere and it were to get snagged, that plastic biner could break without you knowing it and leave you in desperate need of fire. Not that big a deal for most smokers, I personally don’t leave the house without two lighters. But what if I still carry two but also clip this one somewhere and just sort of forget about it? Now, you see, I got a backup to my backup. This lighter did alright for a couple fuelings, then just completely crapped out on me. The little electro spark mechanism still works and when you pull the trigger it sounds like gas is flowing out but no matter how I adjust it, it will not light. It’s too bad because it really seemed like a solid lighter at first. I will say this, this lighter has a feature that I’m not sure that I want a lighter to have. This Luxury Butane Torch Lighter has a lock feature that allows you to ignite the flame and then lock the valve open. I’ve had more than one fire in my hands and “locking” the fuel valve open on a lighter just seems like a bad idea to me. I like this lighter a lot. And really the only thing I count against this one is the near impossible ability to adjust the jet. Yes, it’s made of plastic on the outside and you all know how I feel about plastic but this lighter feels really sturdy. It has a metal clip that holds the lid securely closed. And when you unclip it, you still have to push a little spring-loaded button for the lid to pop open and expose the igniter button. It also has a compass and lanyard loop, giving it added versatility. If you’re a deer hunter, this is a great lighter for you! Perfect color, dependable light for your cigarette(if that’s what you call it) and there’s a compass in case you get lost. I know a lot of hunters and I have been a hunter all my life. One thing I think we all have in common is our life may have never been dependent on us having a compass on hand but there’s been a handful of times that a compass would’ve come in pretty handy. The Premium Spark 4-in-1 is a nice idea and properly executed, could have worked. A sort of latter-day Swiss Army knife of lighters. And it feels solid in the hand but the first time you try to use one of those tools that’s attached, you’ll likely find it inferior in quality to plastic cutlery. It’s just cheaply made and while the lighter initially worked well, when it ran out of fuel I never could get it to refuel. I can recommend the Ronson Jetlite Butane Torch Lighter without question or regard to taste. It is simply the best value on the highest quality available on the market today. You will never go wrong carrying a Ronson in your pocket. 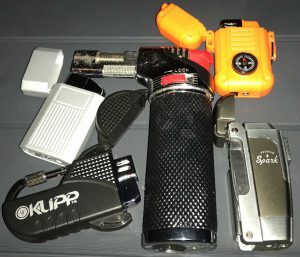 Both UST Ultimate Survival Technologies lighters are well worth the money. They are quality-made, I’m just not a fan of plastic when it can be avoided. The other two, the Luxury Torch and Premium Spark, I would not purchase again. They were cheaply made and while they would be better than nothing, they would not be any more reliable. 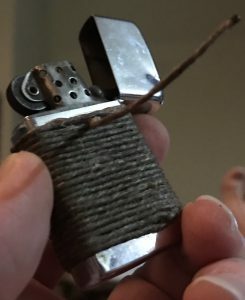 What To Do With Old Cigarette Lighters: Can They Be Repaired? With just a little attention, many of these old relics would be as useful as ever. I recently purchased several large lots of old cigarette lighters. There are always certain attributes of a lot that pique my interest. 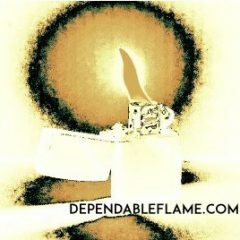 If the lighters were purchased online then ordinarily I don’t really know much about them until I get them in my hands. So, I had seen this lighter in the photo and thought it looked pretty cool but it wasn’t until I received the package in the mail that I knew exactly what I was dealing with. 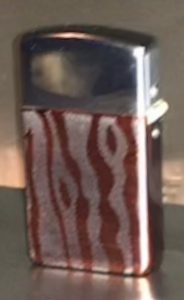 From that photo, same view as the one above, my guess would have been a flip top wick lighter but it could just as easily have been butane. My heart sank though when I picked it up and the lid just fell freely open. 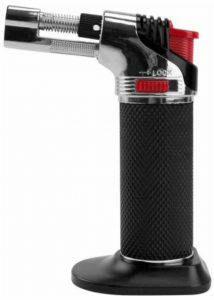 Flip top lighters generally employ some form of tension to enable them to flip open and hold shut. Some times that is achieved with a spring or cam and other times a method is used which is more resistance than tension. Anyway, there are numerous variations and combinations but this Champ lighter had the more crude resistance type tension. I was glad to see that because it is the simplest of these systems to fix. But I didn’t want to go and ruin the value of a lighter that a collector would pay a lot of money for. 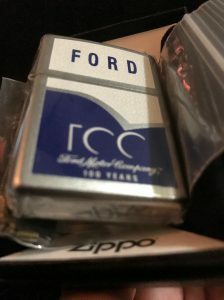 So, I did a quick EBay search and determined that there apparently isn’t much premium put on these old Champ lighters($5-$20) which makes it a perfect lighter for me to fool around with and put in my pocket for a while. With this type system, there is usually a straight, sometimes heat treated piece of metal attached in some fashion to the back of the insert. Now that I think of it, that straight piece of metal is a form of a spring. Problem with this lighter was that piece of metal was broken off. I needed some kind of metal that was rigid enough to provide the tension but pliable enough that it could be cut, filed and shaped without anything other than snips and a hand file. I settled on using a relatively thick blade from an old feeler gauge. Used a small pair of pliers to curl the sides of the blade and then the snips and file to round off the corners and the burrs caused by cutting. Then I just slowly, checking the spacing pretty often, worked it with some medium sandpaper until it fit just right. I left the top squared off for now to make sure it was visible in the photo but when I cut it down I just have to make sure not to cut it too short. It’s a lot easier to snip a little bit more off than it is to shape a whole other blade. On the surface, it looks like so many of the other “Windproof” lighters made in the past century. But despite having to fix the tension problem, I think this may be a lighter I hold onto for a while. It has a really cool leather wrapped grip that seems to be more sturdy than similar others I’ve seen. The chimney cage design is particularly clever. It swivels on the same rivet that holds the flint wheel. That allows access to the wick that is impossible with most other systems. It also appears more than strong enough to use as a handle to gain leverage when removing the insert from the case. It also has a cool little lightweight metal cover panel that is held in place by the flint screw. It is recessed and there’s a slot in the middle which makes refueling pretty easy if you’re careful. And thanks to the spring that I fashioned, it holds closed better than any lighter that I have ever owned. Are You a Collector? Smoker? Camper? Preparing for a Zombie Apocalypse? Whatever it is that causes you to need fire, doesn’t really matter. I need it to light my medicine at any time of the day or night. Occasionally, I need it to light a lantern. Every now and then, I use it to light a water heater or furnace. I intend to fill these posts with as much helpful and useful information as I can about old cigarette lighters. I will also be posting about some of the ways we employ fire and perhaps some alternatives or rediscovered uses, gadgets, etc. 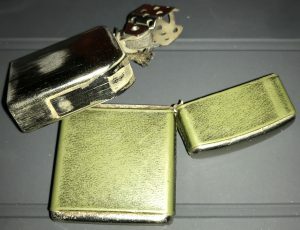 If you collect vintage cigarette lighters, I would love to hear your comments. My main purpose is putting quality old lighters back into service. I have discussed that in another post. But there is a part of me that understands the desire to collect things, I just like to collect things that not only work but I am able to put to use. I would love to hear from anyone who is interested in performing similar repairs or having similar repairs done for you. Maybe you have an heirloom lighter that you don’t want to take the chance of losing in the mail. Comment below, email, text or call. I would love to help you. I spent 25 yrs working for the U.S. Postal Service. Now, this is what I do. Buy, sell, sometimes fix, fool around with old cigarette lighters. I am up late every night(that’s when the magic happens) so hit me up. I’ll get back to you as quickly as I can. And please remember that we are IN SEARCH OF old lighters of all kinds: new old stock, lots, need service, whatever. We accept consignments on arrangement. 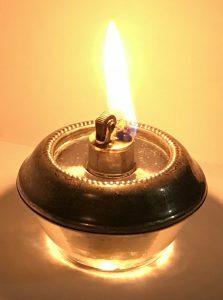 Author JosephPosted on December 19, 2017 December 29, 2017 Categories Lighters14 Comments on What To Do With Old Cigarette Lighters: Can They Be Repaired? One of the coolest things about buying and selling collectible vintage lighters is the sheer number of different lighters that pass through my hands. I love seeing them but what I really want is to use them. That means the coolest, most attractive, collectible lighters do not usually get to make fire before they are sent on to their new home. If working on it could damage the value of a lighter that I intend to sell then I generally don’t. But every now and then I encounter a lighter that seems to be an apparition, like the last time it sparked written history was wiped clean of its existence. Yet, there it is sitting in the palm of my hand like it belongs there and my thumb itching to give it a strike. I purchased the lighter for $10 and that is all I knew about it. 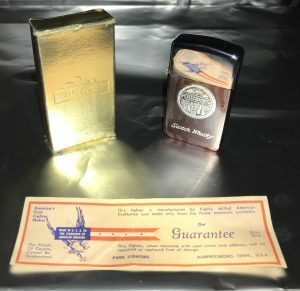 So I started doing a little research on ALLEN-HADDOCK lighters and I found a few listings but most of them were old and none of them were sterling. Long story short, I exhausted my usual sources of information. I’m telling you, that lighter was begging me for a drink. I knew it just wanted to catch fire but I couldn’t stop it. And to be honest I felt a huge relief when I pulled out the insert and found it to be missing its guts: no wick, flint, cotton filling, cover flap or flint screw. Aha! 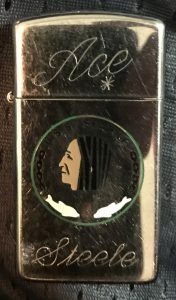 I’m going to have to work on this lighter anyway so, whether its collectible or not is kind of irrelevant and this might be my one and only chance to own and carry a sterling silver lighter. As a frame of reference, consider the Zippo Slim Windproof Lighter. 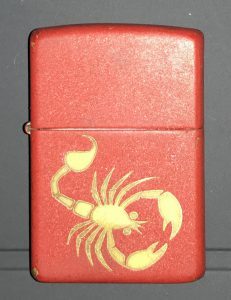 This Allen-Haddock lighter is about a quarter inch shorter than the Slim and perhaps a shade thinner. 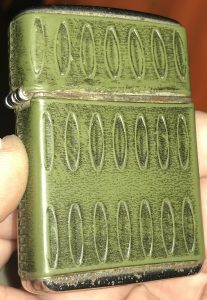 It has a 3 barrel hinge similar to what Zippo had in the late 1940s with the middle bar being wider than the outside bars. It feels very sturdy and closes and holds nicely. 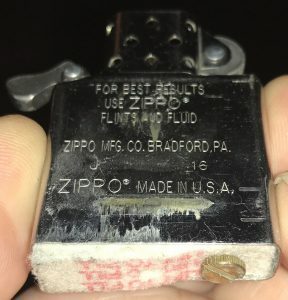 I hear a lot of people talk about the Zippo “ping.” I don’t know if that is a true test of an authentic Zippo. It seems very likely to me that dirt, grime and all sorts gunk could probably affect the sound a lighter makes when opened. 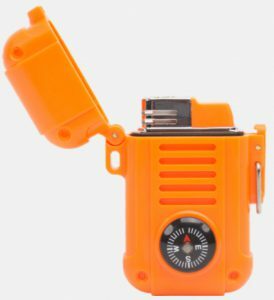 My point though, is this particular ALLEN-HADDOCK lighter makes a sound that does not echo quite like a Zippo. Nevertheless, it functions flawlessly. I robbed the innards from a Slim and the flint screw from an old Japanese brass lighter and cut the spring down to an appropriate length. Filled it up with fuel, spun the wheel and what do you know? This is a pretty nifty little lighter. 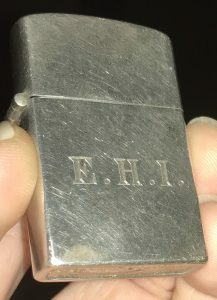 It is engraved E.H.I. on the front and is clearly marked STERLING on the bottom. 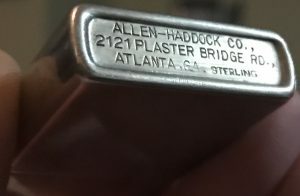 That’s about all I know so far about Allen-Haddock lighters that were apparently manufactured in Atlanta, GA. I hope to run across more of these lighters soon. There are a ton of other old lighters out there that are still capable of making fire or perhaps would be with just minor repairs. If you have a favorite lighter that doesn’t work anymore or would like to repair one as a gift for a loved one, leave a comment at the bottom of the page or send an email or text. I check them often. If you would like to perform the repairs yourself, I will answer any questions, provide you with any resources that I have access to or maybe you’re just stuck and need to bounce some ideas off someone. I’m all ears, I’m here to help and I would love to see you or your loved one lighting up with a lighter that might have thought it had been forgotten. If you’d like a lighter repaired but don’t want to do it yourself then I am your man. Just shoot me a message and we’ll see what you have, come to an agreement(assuming the lighter can be repaired) and go from there. I would also like to know if you have lighters that you’d like to sell or would be interested in consigning to me to sell for you. 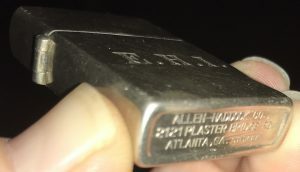 I’d really appreciate readers sharing any info or thoughts you have about this Allen-Haddock lighter or any other vintage smoking aids. I would guess that at some point I will sell this lighter. With the info I have right now, I would be taking a stab in the dark regarding a value(the silver alone is worth more than I paid for it) so I’m not sure where I would price it to sell on EBay. But if I do list it I will include a link on this page and it will include a Make Offer option. So until then, please share any info you might have and I’ll make sure and keep this lighter working. An exploration of a lighter that time forgot. I buy and sell vintage lighters on EBay. Most of what I buy are in bigger lots purchased from various sources. As you can imagine, I come across some very interesting things and am constantly being educated about vintage cigarette lighters for sale that are still relevant in today’s market. I have been wanting to write this article for some time now. Before I get to the lighter I’m going to focus on today, I’d like to tell you a little more about myself. I think I’m just naturally curious but I also grew up with a father who could fix anything. He loved to work on cars and as a child, the time spent in the garage with my father was priceless. I wouldn’t trade those memories for anything in the world. with their hands. Cars are controlled by computers. Phones are computers. It seems we are well on our way to everything being controlled by computers. There are even cigarette lighters you plug into a USB port. I prefer my fire to be actual fire not some electronic facsimile. I would also like this page to be a gathering place for like-minded folks who miss the days when consumer products were fixed rather than being thrown in the trash. So please leave your comments below this article. I’m here to help and I am sure that I can learn from many who read this as well. 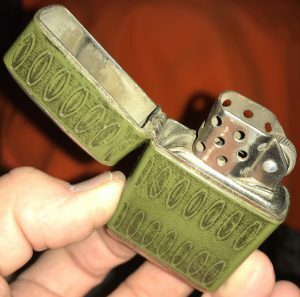 I fuel all my used lighters before listing them and many times will include a photo of the lit lighter in the listing. I do not ordinarily fuel new lighters. But as I said earlier, I’m curious. So, the flint wheel on this Park Lighter was ceased up. It happens all the time. No big deal. New or not, an idle flint can easily corrode when exposed to moisture in the air. But now I have a lighter that is still new but requires a repair that would necessitate listing it as used. Probably lost some money by testing that flint wheel. But I wouldn’t want to sell a lighter(new or used) if the customer wasn’t aware of the condition it is in. That wouldn’t be very good service. And besides if I’m going to sell this lighter as used then I am going to put fuel in it and test it out. Ahh, my favorite part of the job! After fixing my flint wheel problem, I was ready to go. I would like to note that if you’re used to carrying a Zippo this Park Lighter is about the size of a Slim and feels considerably lighter in weight. 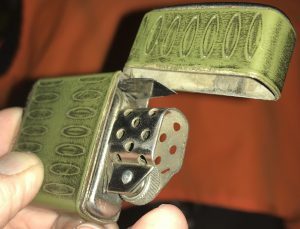 There is no tension cam, the tension to flip open or keep shut is provided by a heavy straight metal band attached to the back of the insert. I’m sure this was cheaper than a cam but seems to work just fine. One other note that I’m sure will concern some is the flint retention screw is made of plastic. If you’ve read any of my posts then you know I’m no fan of plastic. I would prefer that screw have been metal but it’s not and I don’t believe it affects the performance of the lighter one bit. One plastic piece on an old lighter doesn’t change the fact it is a refillable lighter that I believe a person can depend on producing fire when they need it for a very long time to come. What Are Your Favorite Forgotten Lighters? 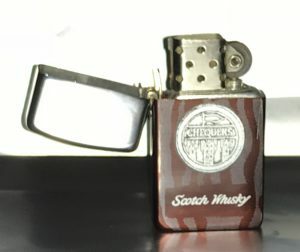 This Chequers Scotch Whisky Park Lighter has become one of my favorites. My experience with this lighter some time back broadened my horizon regarding the sheer number of old lighters available. Just about any lighter is going to have its advantages as well as its flaws. 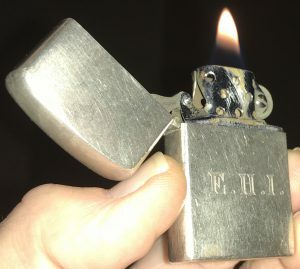 I am very interested to know the opinions of other vintage lighter enthusiasts as well as anyone else who reads this post. We all have our favorite go-to lighter. Many who read this will have their own personal obscure favorite lighter. I would like to discuss those lighters and anything else flame related. I mentioned earlier that I want to help. That is my goal. I believe that despite the disposable world we live in today, there are many who yearn to do something for themselves again. To fix rather than replace. To refill rather than throw away. I’m here available to answer questions anytime. If you have concerns or just want a second opinion about an EBay listing you want to bid on(even if it’s not my listing) or any other site then just ask. I will always give you my honest opinion and there’s a good chance I may have already seen the item you have questions about. As I said back at the beginning, I am a lighter mechanic. That’s what I do. So, ask away. If I don’t know the answer then I NEED to know the answer! I have searched the worldwide web, there and back again, and there is a ton of information out there. Let’s discuss it here!